Windhand have been responsible for two of modern doom’s finest records in the past few years; their bewitching debut and their megalithic Soma, which I still hold up high as THE best doom record by a new band in years. Their dense, Electric Wizard riffs coupled with a ritualistic vocal and an innate sense of the groove gives them this magical status. Their latest effort, Grief’s Infernal Flower comes with an already stellar legacy to protect. At first listen, opener Two Urns isn’t as immediately heavy as Orchard was on Soma. It’s a more trippy groove, almost upbeat, and the solo is a thing of melodic beauty. The instantly recognisable ethereal vocal is what makes Windhand for me. It’s what I imagine Jus Osborn would sound like if he hadn’t spent so much time with horror movies and Satan. And was a woman. That same, irresistible stoner groove penetrates every song on the record, from the soothing rumble of Forest Clouds to the tectonic earth mover riff that opens Hyperion. A lot of bands want you to believe that they can conjure up the spirit of the 70s, injecting their riffs with bland, attempted psychedelica without truly grasping the core concept. Windhand do it so naturally you’ll almost miss it, like the subtle acoustics in lumbering monster Kingfisher or in the creepy ambient parts of Forest Clouds. You’re almost too busy being crushed under the awe-inspiring fuzz of the riff. Sparrow shares the same vibe as Dorthia Cottrell’s solo album, released a few months before, and closer Aition is almost heartbreakingly bleak. Cottrell’s vocals ooze this hypnotising, ethereal magic that entwines itself around every riff, every hanging note with deadly ease. You find yourself hooked entirely in songs like Hesperus, where groove and croon combine to create that transcendent moment. That moment where you cannot turn it off, you cannot turn it down. 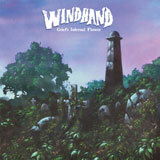 Windhand have you when that happens, and they’ll never let go. You might remember reality one day, but you’ll never truly come back to us. Grief’s Infernal Flower is not an album that rewrites the book of doom. Windhand have no time for your petty rules and your expectations. Windhand are a band that cast us mere mortals a glimpse into the terrifying, endless void and tempt us, siren-like, to give in. You’ll tell your children of this day; the day Windhand ascended to doom’s broken, monolithic throne. Soma was their ascension ceremony, Grief’s Infernal Flower is their crown.